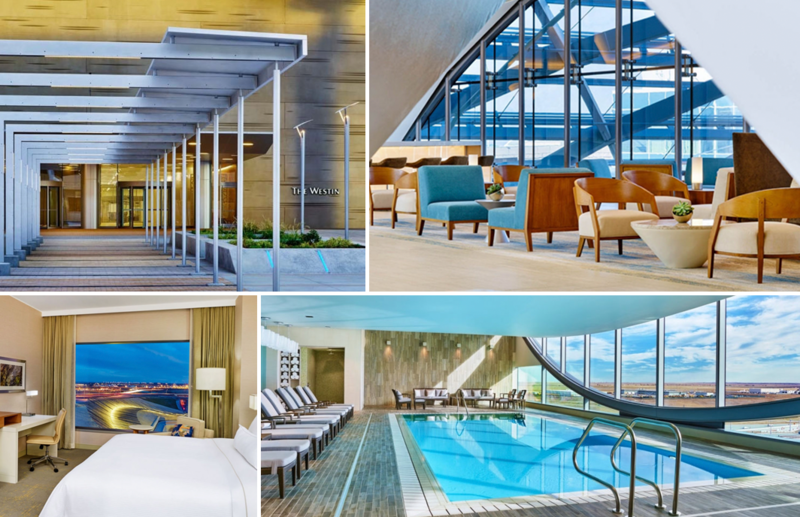 The 518-room, 420,000 square-foot Westin Denver International Airport Hotel and Conference Center is located at the Denver International Airport, and is integrated into the iconic main airport terminal structure via a spectacular open air plaza. The Gensler designed hotel is situated atop the airport’s new light rail public transit center, and provides both hotel guests and airport travelers quick and easy access to the hotel, conference facilities, airport terminals, and to all airport transportation systems. The four star hotel features extensive flexible, state-of-the-art meeting space, full service health club and swimming pool located on the tower’s upper level, full service restaurant, spacious lobby bar, and a full service coffee bar. The expansive covered plaza that connects the hotel to the South side of DEN’s main terminal can host a wide variety of large, outdoor events and activities. All of the meeting facilities incorporate high speed internet access and videoconferencing capabilities.